Dallas Taylor, a noted Christian music singer, has been hospitalized with critical injuries following a serious Florida ATV accident in Ocala, according to The Ocala Star-Banner. Taylor is a founding member of Christian metalcore band Underoath and lead singer of other bands Maylene and Sons of Disaster. The 36-year-old was reportedly operating an all-terrain vehicle (ATV) on property that belongs to a Baptist church shortly after 6 p.m. on a recent Tuesday. Investigators say that as he drove up an embankment, he lost control of the vehicle and then hit a sign. Taylor then reportedly flipped off the vehicle, which then came to a rest on top of him. He was reportedly not wearing a helmet at the time of the ATV accident. He was flown by helicopter to a hospital in Gainesville, where doctors performed a series of neurological tests. His injuries reportedly include a bleed in his brain as well as a clot in his carotid artery. He is also suffering from numersou broken bones. News reports are Dallas and his son, 10, were visiting his native Ocala from Alabama, where they now reside, when the accident happened. He was reportedly riding alone. As far as liability in a case like this, it’s going to depend on many different factors. The defendant owed plaintiff a duty of care. 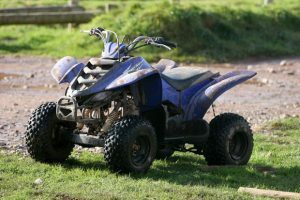 The Consumer Product Safety Commission (CPSC) in its most recent report on ATV-Related Deaths and Injuries indicates there have been more than 13,000 ATV-related fatalities between 1982 and 2013. Just in 2013 alone, there were 426 ATV deaths, which was down from 513 in 2012, down from 620 in 2011 and down from 656 in 2010. However, the CPSC notes this data isn’t complete; the most recent year for which there are completed figures – 2009 – there were 799 deaths. The number of injuries is also substantial – nearly 100,000 in 2013. Approximately one quarter of the ATV-related fatalities involved children under the age of 16. In terms of which state had the most ATV accidents and fatalities, Florida was ranked No. 6, behind Texas, California, Pennsylvania, West Virginia and Kentucky. Whether the driver was operating the ATV without proper training. ATV operation doesn’t require formal training, even though failure to obtain training can result in serious mistakes on treacherous terrain, including steep slopes and paved roads (as ATVs are not designed to operate on paved surfaces). Whether operator is hauling someone or some type of load against the instructions and recommendations of the manufacturer. ATVs aren’t meant to haul loads or additional passengers, and doing so could impede the vehicle’s maneuverability, which could increase the likelihood of a rollover. There is also a risk of the vehicle being over weight limits, which can also impact safety. Whether the operator was a child who was allowed access to an adult-size ATV. There is no age limits on ATVs and children as young as 6 can operate them. However, that doesn’t mean it’s a great idea, and definitely not if the vehicle isn’t adjusted for child use. ATV manufacturers generally recommend children 6 to 11 go no faster than 15 mph – which is still fast enough to suffer serious injury in the event of a crash. Whether the property on which operators were permitted to ride was in fact safe for that purpose. It’s not clear whether Taylor will be able to collect damages from a third party for his injuries, but it may be worth exploring because the medical costs alone are likely to be substantial.